Hotel meeting room The Tenth Puzzle Parley, a "specialty meeting" of the AGPC, was held at the Hawthorne Hotel in Salem, MA Friday thru Sunday, August 13-15, 2010, with an extra day added for those able to drive up to Anne Williams' Open House in Lewiston, ME on Monday to see her puzzle collection and memorabilia. One hundred seventeen (117) jigsaw puzzle cutters, collectors, enthusiasts, dealers, restorers, vendors and guests attended part or all of the program. This broke all records within recent memory for jigsaw puzzle gatherings in the U.S. (except for some of the national puzzle competitions held in the early 1980s). It was also the largest AGPC gathering since its founding. Bob Armstrong and Melinda Shebell co-organized the meeting; Kelly Taylor (www.keljoy.com) served as events planner and did a terrific job. The Hawthorne Hotel also did a fine job handling everything, including last minute changes to accommodate such a large crowd. Bob & Melinda The Parley began Friday afternoon with a short trip out to Jim Ayer's factory in Marblehead, MA to view his water jet puzzle cutting operation. We all marveled at the intricate details Jim was able to cut into his puzzles using a water jet. After a delicious buffet dinner at the Hawthorne, several cutters described their latest creations. 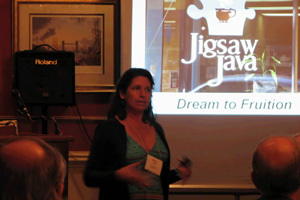 Mary Albitz Then, Mary Albitz described her "Jigsaw Java. From Dream to Fruition", a neighborhood coffee gathering spot featuring lots of jigsaw and mechanical puzzles to assemble and/or buy. She also discussed special events she has organized including a puzzle contest attended by several AGPC members and puzzle activities to help raise money for autism . To our best knowledge, this is the only coffee house with such an emphasis on puzzles in the states. After Mary's presentation many of us participated in a giant "Yankee Swap", in which attendees contributed a wrapped puzzle ostensibly worth $25 to $50 and then each such attendee drew a number and successively opened a puzzle from the pile. He/she could then exchange that puzzle for any puzzle already opened, until the last puzzle was drawn at which point the first person to have drawn could exchange his/her puzzle with any in the room. Complicated, yes, but it worked and was a lot of fun! Puzzling at night The Yankee Swap was followed by a cutters' swap. Each cutter participating brought one of their own hand cut jigsaw puzzles to swap with each of the other cutters participating in the swap. A fast way to build a collection of puzzles cut by today's makers! Many attendees then adjourned to the Library where there were all kinds of jigsaw puzzles awaiting assembly. Dee Rogers' Circus Puzzle Saturday was the big day with attendance expanding as the meeting progressed. The room was lined with jigsaw puzzles set up on tables by cutters and collectors, a magnificent sight for any puzzler. The meeting started with "Cutters' Conversation" during which puzzle cutters discussed various issues. Then, Dee Rogers demonstrated a magnificent 3-D puzzle of a circus scene in which the figure pieces lying in the puzzle when flat could be reinserted to stand up and link together to form complicated structures rising up from the puzzle such as dogs jumping through hoops and an acrobat pyramid. Dee certainly is one of the most innovative puzzle makers in recent years. Anne Williams After "Cutters' Conversation" Anne Williams delivered her usual fine presentation, this time on "How Did They Do It? Parker Brothers' Pastime Puzzles", most appropriate since our meeting was taking place in Salem, not too far from the former factory building where the Pastime puzzles were cut. Especially fascinating were Anne's comments on the environment in the Pastime cutting room and the human side of puzzle cutting 50 to 100 years ago. Since Pastime puzzles are much in demand these days, collectors and enthusiasts in the audience listened with great care, some even taking notes. Anne's presentation was followed by a buffet lunch during which Mark Cappitella set up his scroll saw and gave a demonstration on puzzle cutting, and Boulter Plywood, Ben's Scroll Saw, Mike's Workshop and Friend Box Co. displayed examples of their plywood, blades and puzzle boxes. Dana Haviland The afternoon began with Dana Haviland, a relatively new collector, giving a power point presentation on her "Bluebird Collection". Dana has been a serious buyer on EBay the past few years and has amassed an amazing collection of puzzles focused on "Story Puzzles", "Beautiful Women", Pears prints and several other themes. Rob Jones After Dana, Rob Jones described his efforts of the last year to build a "mega-website" where anybody can show the world their favorite puzzles, and gave an actual demonstration of how the site will work. He quickly uploaded data on a puzzle, and then having already uploaded data from Bob Armstrong's collection, showed how the site could be used to search for puzzles based on different criteria. Shawn Ferguson with family at Show & Tell Rob's presentation led into Show & Tell where anyone could talk about his/her favorite puzzle, followed by Table Sales during which many puzzles were bought and sold and cutters of new puzzles gained new customers for their work. John Stokes & Bob Armstrong All during the day, on display was John Stokes' most recent masterpiece, a 4271 p. jigsaw puzzle depicting the famous triptych by Hieronymus Bosch titled, "Garden of Earthly Delights" which had recently sold for $25,100 on EBay to one of our Parley attendees. This was the second highest amount ever paid for a jigsaw puzzle, behind only the $27,000 paid for a Pagey Elliott puzzle at a charitable auction run by the National Golden Retrievers Club a few of years ago. Thus, after a delicious banquet meal, John described his 100 puzzles project of which "Garden of Earthly Delights" was the 100th and final puzzle and to the audience's complete amazement, showed slides of some of his childhood drawings which fore-shadowed his creative cutting style of today. In his introduction of John, Bob Armstrong described John as the "Cutter of the Decade" and his masterpiece "arguably the greatest jigsaw puzzle ever made". A second night of puzzle assembling followed in the Hotel Library which was reserved for our sole use the entire weekend so we could store and leave out puzzles there. Francesca & Paolo Following a continental breakfast Sunday morning, Melinda Shebell and Bob Armstrong handed out prizes and awards. Anne Williams received a commemorative decorated plate with a gold puzzle piece for being the only person with perfect attendance at all 10 puzzle parleys, and Bob Armstrong a mug for attending 9 1/2 parleys!. Then Melinda showed us some tricks on, "Using Photoshop to Make Artwork for Replacement Pieces," and Bob followed with a demonstration, "How NOT to Make Replacement Pieces". Finally, Bob closed the meeting with his power point presentation, "Pictures in Puzzles", delivered last March during the AGPC cruise convention to Belize. Among the many puzzles flashed on the screen from Bob's collection was "Francesca and Paolo", purchased by Bob over a decade ago from one of the attendees in the audience. A friend of Bob's tipped him off that the scene was the climax of a torrid love scene from Canto V of Dante's Devine Comedy and the basis of a thrilling suite, Francesca da Rimini, by Tchaikovsky. Bob suggested that such a history and scene is what can make a great puzzle. On Monday, 35 attendees made the 3 hour drive up to Anne Williams' Open House in Lewiston, ME to view her renowned collection of puzzles and puzzle memorabilia. That concluded a 4 day weekend filled with many and varied jigsaw puzzle activities and record numbers of participants. From all accounts it was the most successful Parley ever.